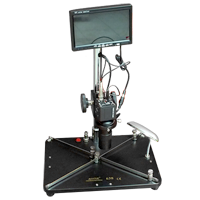 Aoyue 638 - board inspection system is a device allowing the inspection of motherboards. With an integrated camera with a lens with variable magnification and a maximum of approximately 100x you can see exactly even the smallest connection between the pins of integrated circuits, as well as the state of soldering BGA chips. 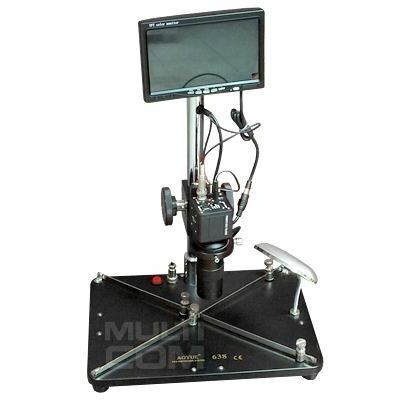 The handle is attached with 7 "TFT color monitor on which you can easily see the place of inspection, the platform features a curved LED lamp illuminates the place of the inspection arm. - Variable-magnification lens, the maximum magnification: 100x. - Convenient platform to handle. - Stable mount the camera and screen. - Adjustable camera for different magnifications. - Integrated source of light.